W.F. Burns Middle School in Alabama is asking students to bring in canned goods, but not as part of a food drive. Believe it or not, there’s a connection between canned food and school violence. According to local news station Alabama 13, Principal Priscella Holley of W.F. 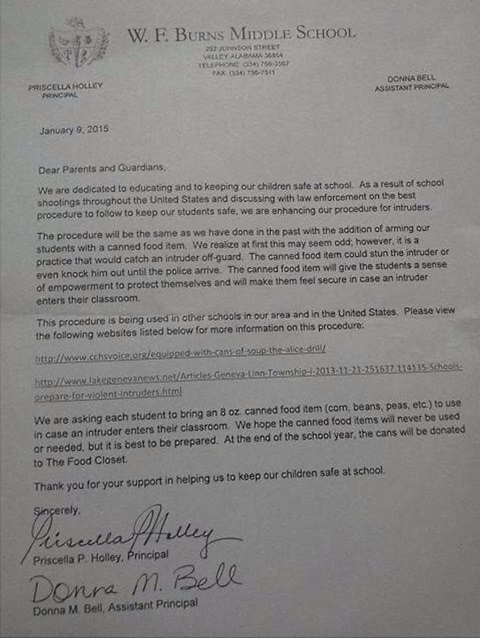 Burns Middle School in Valley, AL, sent a letter home to parents asking students to bring in canned food to use in case of school intruders or shooters. Students are currently being trained under the ALICE program for active shooter situations, which is an acronym that stands for Alert, Lockdown, Inform, Counter, and Evacuate. The canned goods are part of the “C” in “ALICE,” and are intended for students to throw at an active shooter as a last resort before evacuating the school. Hodge told WHNT that schools in 30 states are also utilizing ALICE principles, which fit new school safety guidelines issued by the Department of Education in 2013. At the end of the school year, all leftover canned food will be donated to a local food pantry. Parent response to the letter has been mixed, but mostly positive. One parent told Alabama’s 13 that she’s more worried that students will use the canned goods to harm other students. WHNT reports that Hodge says most negative responses have come from Facebook, from people who don’t have children in the Chambers County Schools district.